Passenger cars only. Height restrictions apply. THE HARLEM RIVER SPEEDWAY: Recognizing the long-standing popularity of horse racing among New Yorkers, the city built a "Harlem River Speedway" along the west bank of the Harlem River in Manhattan. The 95-foot-wide dirt roadway stretched two and one-half miles from West 155th Street north to West 208th Street. Presaging the automobile parkways of the 20th century, the speedway was flanked by trees and pedestrian walkways. When it was not being used as a racetrack, the Harlem River Speedway was used as an exercise track. HORSE PATH GIVES WAY TO AUTOMOBILE PARKWAY: Originally planned in the early 1930s as an extension of the East River (FDR) Drive, the Harlem River Drive was built atop the old Harlem River Speedway. The parkway features six 12-foot-wide lanes, long viaducts for grade separation, and landscaping between the parkway and the river. While the parkway was not constructed with shoulders, it does have emergency pull-off ramps for disabled vehicles. In some locations along the Harlem River Drive, existing at-grade sections were to be reconstructed, just like those along the FDR Drive. Along one section of the Harlem River Drive, both the northbound and southbound lanes have an unobstructed view of the Harlem River. To achieve this effect, the northbound lanes were constructed just above river level, while the southbound lanes were constructed on a viaduct. This project provides a six-lane highway from the Manhattan end of the Triborough Bridge and the north end of the East River (FDR) Drive to the tunnels under Manhattan connecting with the George Washington Bridge. It skirts the waterfront of the Harlem River with access to intermediate river crossings. Provision is made for industrial development and service roads in the area along the river at proper locations. This route is the most practical means of providing traffic flow from the New England shore route across the Hudson River into northern New Jersey. The cost of slashing a major artery crossing the Bronx easterly from the George Washington Bridge would be prohibitive. The construction cost is estimated at $11,700,000. It is estimated that the assess valuation of land to be acquired for this project will amount to $5,800,000. City-owned land valued at $1,800,000 is planned to be used. The Harlem River Drive will form an essential part of the express highway system by providing a direct connection between the East River (FDR) Drive and the George Washington Bridge via the 178th Street Tunnel. It will also serve as a general interchange facility for various streams of traffic between the northwest and the southeast, through the use of the Harlem River bridges, with which it and the Putnam Express Highway (Major Deegan Expressway) would be interconnected. It would also serve to encourage reclamation of the Harlem River waterfront area. The new parkway was to incorporate sections of the existing "Harlem River Driveway," a boulevard along the river, and an arched viaduct approach to the 178th Street and 179th Street tunnels. According to Stan Lechner, a civil engineer who has spent 50 years with the New York State Department of Transportation (NYSDOT), work had begun on a ramp to connect the viaduct to upper Manhattan streets, but the ramp was never completed. CONSTRUCTING THE FDR EXTENSION: Construction of the new controlled-access parkway began just north of the Triborough Bridge in 1947. Eight years later, in their Joint Study of Arterial Facilities, the Triborough Bridge and Tunnel Authority and the Port Authority of New York recommended expediting construction of the route, in preparation for the proposed six-lane lower level addition to the George Washington Bridge. In the Joint Study, the Harlem River Drive was planned as a north-south artery that would feed into the lower deck of the bridge. The Harlem River Drive continues north to the Inwood section of Manhattan, where it ends at a "Y" intersection. (Originally, the parkway ended at a traffic circle.) Tenth Avenue and Dyckman Street form the "arms" of this "Y" intersection. The parkway neared completion when the lower deck of the George Washington Bridge and the Trans-Manhattan Expressway opened to traffic in August 1962. By that time, only the 13-block viaduct section between 155th Street and 168th Street, a rebuilding of the original Harlem River Drive at that location, remained under construction. The entire length of the $38 million Harlem River Drive opened in early 1964, in time for the New York World's Fair. CURRENT AND FUTURE IMPROVEMENTS: The Harlem River Drive is maintained by the New York City Department of Transportation (NYCDOT). Surrounding rights-of-way are maintained by the New York City Parks Department. Major reconstruction work is undertaken by the New York State Department of Transportation (NYSDOT), which also installs signs and reference markers. According to the NYSDOT, the six-lane parkway handles approximately 100,000 vehicles per day (AADT). In conjunction with state and city environmental agencies, transportation officials redeveloped and extended the wetlands by Sherman Creek, at the northern terminus of the Harlem River Drive. The $3.2 million project was finished in 2003. The NYSDOT plans to rebuild the 127th Street Viaduct, which carries currently carries two northbound and three southbound lanes of the parkway between the Willis Avenue and Third Avenue bridges. The existing 11-span viaduct suffers from poor mainline geometry, inadequate entrance and exit ramps, and dangerous weaving conditions. After demolishing the old superstructure, the NYSDOT will build a bridge on new alignment that will provide four northbound lanes and five southbound lanes. Roadway slopes will be improved in both directions to improve safety. The existing southbound EXIT 19 (Second Avenue / East 125th Street) will remain in its current location, but there will be a new southbound EXIT 17 (I-278 / Triborough Bridge) with a flyover ramp and dedicated lane. There also will be new at-grade access (under the viaduct) to provide waterfront access from the street grid. Construction of the $76 million project is expected began in 2011, with completion scheduled for 2019. 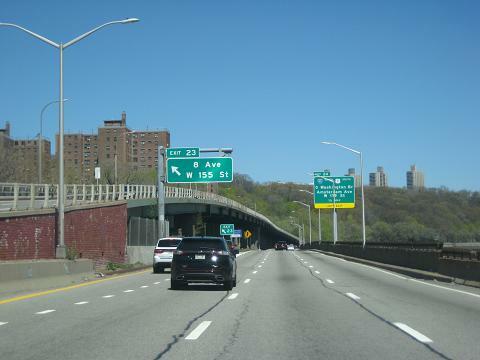 In a long-term project, the NYSDOT plans to rebuild the ramps connecting the Harlem River Drive to the Trans-Manhattan Expressway (I-95, US 1, and US 9). Preliminary design work is expected to begin by 2010. In 2001, the New York City Parks Department began work on the Harlem River Park and Esplanade, a 6.5-acre riverfront park stretching from 131st Street north to 145th Street, located on the site of a former dump. The $3 million project will add a pedestrian and bicycle path along the Harlem River, and when completed, will connect to the existing multi-use path along the FDR Drive and the East River. In 2003, the NYSDOT ceremonially re-designated the parkway as the "369th Harlem Hellfighters Drive," in honor of the all-black regiment that fought to defend France during World War I. The regiment proved its mettle in a segregated Army, serving 191 days (longer than any other U.S unit during the war) without relinquishing any ground. SOURCES: "Vital Gaps in the New York Metropolitan Arterial System," Triborough Bridge Authority (1940); "Master Plan: Express Highways, Parkways and Major Streets," New York City Planning Commission (1941); Joint Study of Arterial Facilities, The Port of New York Authority and the Triborough Bridge and Tunnel Authority (1955); "Harlem Drive Link To Open Today," The New York Times (8/31/1962); Arterial Progress 1959-1965, Triborough Bridge and Tunnel Authority (1965); The Power Broker by Robert A. Caro, Vintage Books-Random House (1974); "A Guide to Civil Engineering Projects in and Around New York City," American Society of Civil Engineers (1997); Bridges of New York City by Cara A. Sutherland, Barnes and Noble Publishing (2003); "Lt. James Reese Europe" by Rudi Williams; Arlington National Cemetery Archives (2003); New York City Parks Department; New York Metropolitan Transportation Council; Hank Eisenstein; David. J. Greenberger; Stan Lechner; Ralph Herman; Nathan W. Perry; Jeff Saltzman. Harlem River Drive shield by Ralph Herman. 1950s Harlem River Drive guide sign photo by David J. Greenberger. Bike route sign by Richard C. Moeur. Harlem River Drive exit list by Steve Anderson.